Club Penguin Cheats by Mimo777 Club Penguin Cheats by Mimo777: Club Penguin Stamp Reviewed By You! "I think there should be a make a difference stamp! For this stamp you can either donate to the coins for change when it comes around or help work at the recycling center! I think this will help people notice how they can make such a difference just by working together! You can even make friends while your working together. But every times someone helps, it makes a difference!" 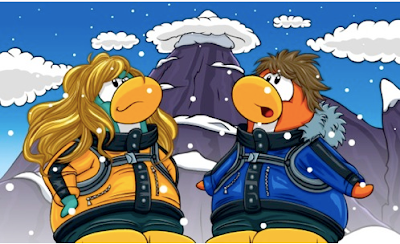 For next week, Club Penguin wants to know what challenges you think you will face on your way to the top of the Mountain Expediton? Remember the Mountain Expedition begins August 13th! What DO you think we will have to do during this expedition? That was a good reviewed by you! hey Mimo, Ive got a cheat for you. every game i play it says i earn for example, 51 coins, then a small blue box appears and oubles it and gives me 102 coins! is this happening to any one else? Oh jk i read this post b4 the one b4 this one. hee hee oops... idk why its not there? why did you take all of the "correct" answers to the contest out of comment list thingy majiger?? Hey Mimo I have a Cheat for you it's that the EPF invite postcard changed! im not that sure what we will do in the mountain exspodision but it will be fun! P.S. its my birthday to day! I think Riley is right there could be an avalanche or we will get run down by a giant snowball!!! Eek! has anyone relized that this mountain expidition might bring us to a brand new dojo for card jitsu snow? Mimo posted that already, look below! Ya, we might. But hopefully we don't. I'm too young to die! mimo i think we will discover ice ninja hideout! that would rock! Why is my comment being reposted like 50 times? And also I made that comment before mimo made the update. P.S. I hope you don't mind my smileys, Mimo! It think they look really cool, hey? I hope we get them when the mountain comes out.